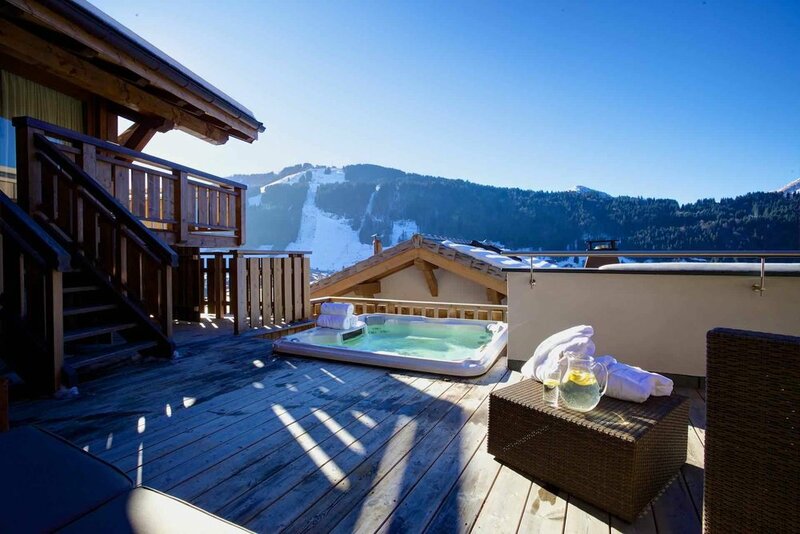 "We had a great week staying at the Chalet Bouquetin. Our chef and host looked after us superbly, providing us with outstanding food and hospitality. The chalet was first class and the girls certainly enjoyed the cinema room and jacuzzi. Our driver was excellent, always on hand to take us where we wanted in the morning and also pick us up late afternoon!!" The residence is nestled in a secluded enclave below the south facing forests of the Zorre, it offers breath taking views across the valley and is only a stone’s throw away from the centre of Morzine. The property has been cleverly designed over a number of floors and comfortably sleeps ten guests. As you enter the chalet you are greeted by a beautiful vaulted wine cellar and cut glass chandelier, which highlight the detail and indulgent design of the chalet. The large cinema room with reclining leather arm chairs, projector screen and Kaleidascape surround sound entertainment system is also situated on the same floor along with four of the bedrooms and the sauna. The main floor comprises of a beautiful split-level lounge and dining area. The lounge with luxurious oversized sofas and soft furnishings is centred around a three metre open fire and enjoys stunning views across the valley. The dining area enjoys the same exceptional views and provides the perfect setting for indulgent dinner parties after a tough day on the slopes. Leading off from this level is the expansive sun terrace with a sunken outdoor hot tub. 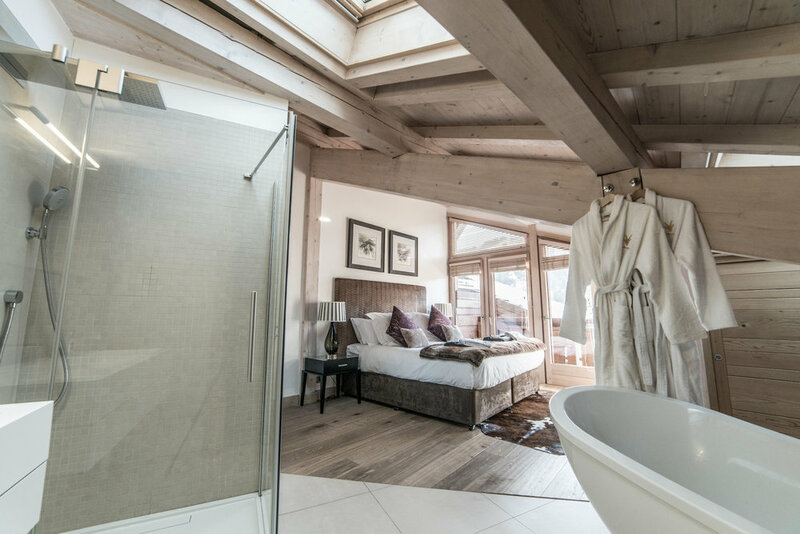 The master suite occupies the top floor with a rain shower big enough for two as well as a freestanding bath within the bedroom. With stunning facilities and our summit level service you’ll find it hard to leave. Room 5 - Double bed, en-suite with double sink, walk in shower and freestanding bath. We are committed to providing our guests with a professional, experienced and friendly service to ensure that their holiday runs smoothly from initial phone call through to their return home at the end of their stay. Our concierge team will guide you through all aspects of your holiday before your departure to ensure that your holiday enjoyment is maximised. 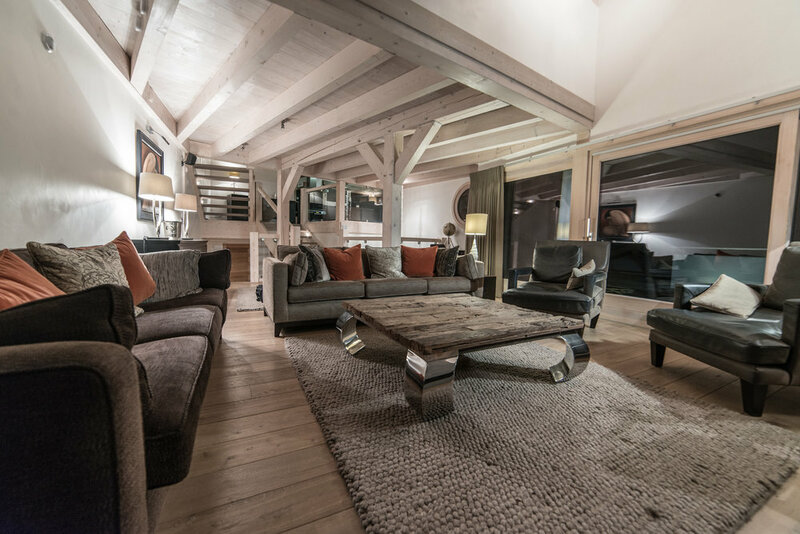 Our experienced team of chalet managers, chefs, hosts and drivers will welcome you to the chalet and be on hand to deliver attentive, unobtrusive and professional service through your stay. Thank you very much for submitting your enquiry. Our sales team are in the office between 9am and 6pm Monday to Friday and until 1pm on Saturdays, so will respond to your email as quickly as possible. Outside of these times we do check our emails, so we will endeavour to get back to you before the start of the next working day. We are always happy to talk through the details of our holidays and are particularly passionate about skiing and snowboarding so please give us a call to chat about either - 01625 400060.